The Alpine Swiss is very stylish and has two handles for convenient carrying. One of the handles is telescoping so it can be pulled around. The inline wheels make it perfect for a business person who does a lot of traveling. The polyester fabric and zipper closure are durable and long lasting. There is plenty of room for all of your business needs, including a file pocket that holds your files and paperwork. The handles are padded for maximum comfort. Briefcases got their name from the original purpose of these cases which was to carry legal briefs for attorneys. Nowadays, briefcases carry a lot more than just briefs. They are a staple of many upper level businessmen and women and come in a large variety of styles, sizes and materials. While they are still a highly functional item, they also serve as a style statement that can add professionalism and polish to a business person’s attire. There are briefcases for all preferences so finding one to fit your needs and personal style is assured. There are many things that you should consider when choosing the right briefcase for your needs. We spent over 30 hours researching and testing 16 different kinds of briefcases and found that convenience, durability, and storage capacity were most important. We will provide you with these considerations as well as tips on how to sort through the many different choices available so you can make a decision on the right briefcase for your business and personal needs. The right knowledge will make the research and decision making process much less overwhelming. The clean and professional look of this classically styled briefcase makes this Alpine Swiss Leather Attaché Briefcase perfect for all your professional needs. It is made from genuine leather and measures 19” x 14” x 4” when expanded. The convenient handle makes carrying the case very comfortable. This case locks and has combination locks that can be set with two different numbers. This enables each side to have its own combination. This case can handle several file folders and has an organizer section inside that is perfect for carrying needed business essentials such as business cards, pens, etc. There are 4 protective metal feet on the bottom of the case to prevent the leather from being scratched or damaged. This attractive and very business-like briefcase makes a beautiful gift for the business person in your life. It comes with a 1 year manufacturer’s warranty. This genuine leather Samsonite Expandable Briefcase measures 12 ¾” x 16 ¾” and is the perfect briefcase for executives and office people of all kinds. It works great for lawyers, doctors and teachers as well. It contains a front pocket organization section for all of those important business needs including cell phone, pencils, cards, pens and other office supplies. The Samsonite briefcase has a large amount of capacity for all your needs. The main compartment is large enough for books, folders, binders and other paperwork. There is a separate compartment for files and yet another one for carrying your laptop. This attractive bag is easy to carry thanks to the padded adjustable and removable shoulder strap. You can also use the convenient top handles as well. This is the case you need to take care of all of your business needs so you stay organized in style. This stylish briefcase has two handles; a telescoping one for pulling and shorter ones for carrying. 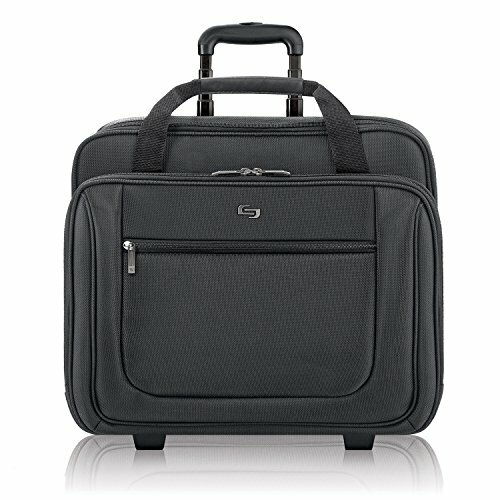 It also has inline wheels making it a very convenient briefcase for any business person that travels a lot. Made of polyester fabric with a zipper closure, this 14” wide and 9” high briefcase provides plenty of space for a large number of business items. The padded compartment can hold a laptop up to 17.3”. There is a front zippered pocket along with an organizer section that zips down. A file pocket holds files and paperwork that you need to carry. The padded handles make transport much more comfortable and the slim profile makes the briefcase suitable for any number of executives and office people. The telescoping handle opens with a hidden pushbutton and makes airport or city treks much easier than lugging a bag around. The inline wheels are compact and durable, integrated into the base of the case so they move smoothly without adding bulk. This stylish and long lasting briefcase by SOLO comes with a 5 year warranty. There are many different types, styles and sizes of briefcases on the market. Some are the traditional, hard-sided briefcases that people are used to seeing. Others are soft-sided and can have carry straps, wheels and other features. With all of these choices available, deciding on the right one can be overwhelming. The best way to tackle this decision is to start with identifying your needs. Next determine your preferences and then if there is going to be a budget, set one. Once you know what your needs and preferences are you will be able to look at all of the selections in a more organized way, eliminating the ones that don’t fit your needs or likes right off the bat. To learn more about the different types of briefcases on the market, read the buyer’s guide below. It is full of information that will educate you on the kinds of briefcases available, the materials they are made of and other important factors that you will be looking at in your searches. There are many different materials that are used for briefcases. The type of material used will play a part in the appearance, price, and durability of the briefcase. We have listed the most common materials used and some characteristics of each below. Leather – Leather is the most common and popular material a briefcase can be made of. It is durable, beautiful to look at and touch and it lasts a long time as well. Leather is used for hard-sided and soft-sided briefcases. The most common types of hide used in construction is top-grain and full-grain leathers. These are the strongest and most durable hides. If you are looking for economy options, split-grain or corrected-grain leathers are good choices. Suede is also sometimes used for the inside of briefcases but it doesn’t make a good choice for the exterior due to the reduced durability. Vinyl – vinyl that is waterproof looks like leather but is much less expensive. It is also a good choice for those who want an alternative to using animal hides. Vinyl can come on textures that are shiny or rubber like and can offer color options as well. The downside to vinyl is that it doesn’t last as long as leather. The good news is that the lower cost makes it fairly inexpensive to replace. Metal – Metal brief cases are made from aluminum that is lightweight and sleek looking. They are very contemporary in style and appeal to those who prefer the contemporary look. There are some versions of metal briefcases that have a powder coating or anodized finish that turns the silver black. 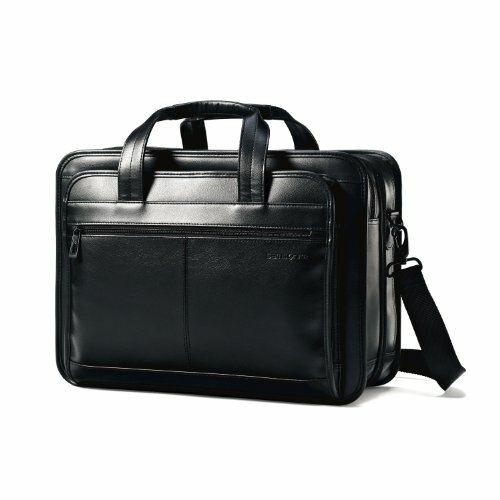 This type of briefcase is very sturdy and is weather proof as well. They are usually less expensive than leather due to being made from recycled materials. Fabric – Soft-sided briefcases can be made from nylon, canvas, or leather. There are many different styles available in the soft-sided briefcase line. Soft-sided briefcases are strong enough to protect what you carry in them but are lightweight enough to make carrying them very comfortable and convenient. Some of the hard-sided briefcases may have fabric panels that with leather accents but most fabric cases have soft sides. 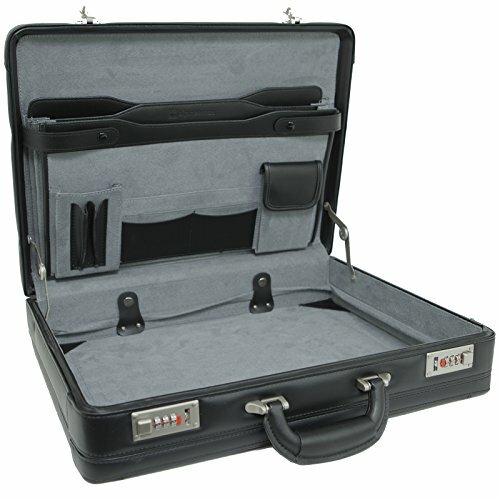 Prices for soft-sided briefcases will vary according to the material they are made of and whether they have leather accents or are completely made out of leather. The main difference between the different types of briefcases is whether they are hard-sided or soft-sided. Designs can be different among both types which provide you with a lot of choices. Hard-Sided – A hard-sided briefcase has a rigid frame that is very lightweight. It is made out of sturdy plastic, aluminum or cardboard. Hard-sided briefcases have a clasp at the top that can be locked. Sometimes there are two clasps, one on each end with a hinged part that opens. These cases open like a clamshell. Depending on the style, the top and bottom may be equal in depth or the case might have a shallower top and deeper bottom. Neither is better than the other, so personal preference plays a part in which of them you choose. This kind of briefcase has a short handle on top for easier carrying. The inside of a hard-sided briefcase will vary and include dividers, folders where paperwork can go and an organizer section for business cards, pens, pencils, cell phones and other supplies. Some have straps that will hold a tablet securely while the case is carried around. Hard cases offer more protection for your files and important paperwork but it doesn’t fit into tight spots very easily. Attaché Case – This is similar to a briefcase but is usually thinner and smaller in size. Attaché cases have one or two pockets where you can put papers and important documents. Soft-Sided – These briefcases don’t have a hard frame and usually open from the top. These are great for storing papers and documents. Soft-sided briefcases are made from plastic, vinyl, nylon or leather. They usually have a long, shoulder strap and short handles offering users a choice of how to carry them. One of advantages to a soft sided briefcase is how flexible they are. They can expand to hold more items if needed and most have a pocket for laptops which most business people like to carry with them in today’s busy business world. When you start searching for a briefcase, make sure you look for these important features. Stitching – The stitching on your briefcase should be free of loose threads and be uniform, straight and small. Check the inside and outside for consistency. Look for descriptions that use reinforced to describe the stitching. Durable, Metal Zippers – Plastic zippers can break so easily. Opt for metal zippers that are not flimsy. Read reviews to see what people have to say about the zippers. You can gain a lot of knowledge from reading the reviews. Hinges – Hinges should be strong and durable and not loose at all. Handles – The handles of your briefcase are very important. They should be securely attached to the body of the case with sturdy metal fixtures or reinforced stitching. Avoid handles that have been glued on. They come loose very easily. Briefcase Edges – This is the point where thinning can occur and the leather can peel or split. Look for cases that have these points reinforced. Briefcase compartments are very helpful in carrying important papers, documents and other business equipment and supplies. The biggest consideration that you will need to think about is how much space you need for the items you will be carrying with you. Make sure that there are enough compartments in the briefcase to keep the contents organized, especially if you carry a lot of things with you. A good quality briefcase is a necessary piece of equipment for anyone who carries paperwork and items in their case for work and personal use. With all of the different styles, materials, and sizes on the market there are plenty of briefcases to choose from. When you have the right information and know what to look for, sorting through all those choices becomes much easier. The three top rated choices we have featured above are excellent examples of the types of briefcases available. Any one of these choices would be an excellent briefcase for a business person. There is plenty of room in all of them for your essentials and more. All of them are high quality cases that will add style as well as function.